Dr. K.Sudhakar Babu is working as Professor of Chemistry, Sri Krishnadevaraya University, Anantapur. He has 23 years of teaching and research experience. He got his PhD from SK University in 1995. His area of research interest is Coordination Chemistry, Electro-Inorganic Chemistry and Applied Environmental research. Sixteen research scholars have been awarded Ph.D degrees under his guidance and Five M.Phil degrees are awarded. He has executed two major research projects funded by UGC and ISRO significantly in the area of environmental pollution studies. Industrial Personnel and NRIs are pursuing Ph.D research programme under his guidance. Other Contributions: He has organized four international chemistry Olympiad Programs in different parts of the country. He is actively engaged in conducting environmental awareness programs and science awareness programmes for well being of all sections of people. He is now contributing educational articles to different dailies for well being of community. He has organized more than 27 National Seminars and conceptual basic scientific demonstrations all over the country. He is the Executive Council member of Sri Krishnadevaraya University, Anantapur nominated by Government of Andhra Pradesh. 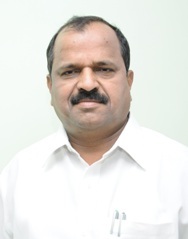 He has been elected as Executive Council Member, Association of Chemistry Teachers, India representing eight states in southern india including Andhra Pradesh and serving for cause of chemistry education and contributing services for promoting excellence in chemistry education and research. Publications & Patents: He has published nearly 140 research papers in Reputed National and International journals. NRIs working under his research guidance applied for patents in their respective research fields. He has published five books in the field of Inorganic and Environmental Chemistry.Two NRI Candidates got patents in their respective research field under the guidance of Prof K.Sudhakar Babu. Awards and Honors: Recipient of Asian Biographical Citation award, National Best Teacher Award conferred by CRSI, Indian Institute of Science, Bangalore in recognition of his contribution for growth of chemical education in particular and science education in particular, Best Scientist Award by Birla Institute. He has been elected as Fellow Member, AP Akademy of Sciences, Govt. of A.P. Membership in Scientific Bodies-State/National/International: Life member Electro Chemical Society on India, Indian Council of Chemists, Indian Chemical Society, Fellow Member of International Congress of Chemistry and Environment, Life Member of Indian Science Congress Association (ISCA) and a Fellow member of American Chemical Society.